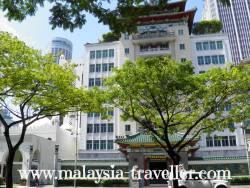 This Singapore Heritage Walk is the route taken by my son and I on a recent trip to Singapore. 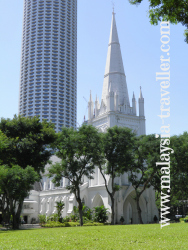 It covers many of the historic sights and attractions in the heart of this famous city. The main points of interest are marked on this interactive map (zoom in and scroll around for a closer look). We started our Singapore Heritage Walk at the Queen Street Bus Terminal because that is where our bus from Malaysia (JB) dropped us off. Crossing over Victoria Street we enter the area known as Kampong Glam, which is a grid of narrow lanes with Middle East-related names such as Arab Street, Muscat Street, Baghdad Street and Bussorah (Basra?) Street. 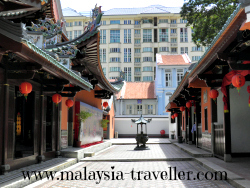 These lanes surround a picturesque mosque called Masjid Sultan, (1928) designed by British architects. 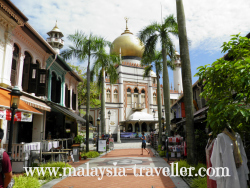 The area has been smartened up with restored shophouses but retains a Muslim feel with lots of Arabian eateries and tourist shops. Moving on to Bugis Street, this area was named after the sea-faring Bugis people of southern Sulawesi who used to trade here. Up until the 1980's this area was notorious for its transvestites and the raucous behaviour that they attracted. 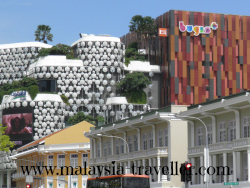 Most of the old area was swept away as part of the city's regeneration and today the original Bugis Street is a more sanitised affair and is hemmed in by shopping malls and tower blocks but is the venue for a popular night market. 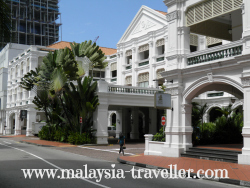 A couple of minutes walk away is Singapore's most famous hotel, the Raffles. 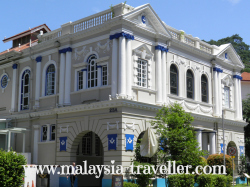 Established in 1887 by the Sarkies Brothers, this graceful building was designed by Swan and Maclaren, the same firm that designed the Masjid Sultan. 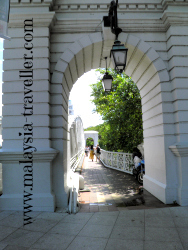 Tourists can wander the elegant shopping arcade, enjoy the tropical courtyard ambience and perhaps have a drink in the Long Bar, famous for having invented the Singapore Sling and for being patronised by the likes of Somerset Maugham and Ernest Hemmingway. I last visited the Long Bar decades ago when it was de-riguer for drinkers to drop their monkey-nut shells on the floor which even then I thought was inappropriate for such an up-market establishment. In the next block is the Chijmes complex which began life in 1854 as the Convent of the Holy Infant Jesus (CHIJ) to provide education for orphans. The complex comprises Caldwell House (the convent), CHIJMES Hall (completed in 1903 as the convent's chapel) and other smaller buildings. The convent was relocated in 1983 and Chijmes has been converted into a vibrant commercial development with a number of restaurants and bars. Continuing up Bras Basah Road, we reach the Singapore Art Museum. This impressive building mainly dates from 1855 and was a Catholic boy's school, St Joseph's Institution, run by La Salle Brothers until it relocated in 1990. Skilful restorations and modifications were made to adapt it for museum use while retaining the original facade. It displays contemporary art from around the region. Almost facing is the National Museum of Singapore. 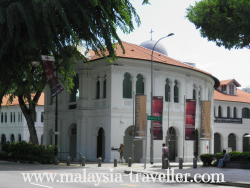 NMS is the oldest museum in Singapore and its current premises were built in 1887 with further additions over the years including a modern glass and metal extension. The main building is in neo-Palladian architecture with a rotunda dome. The museum's history gallery is of interest to heritage lovers. On the corner of Stamford Road and Armenian Street stands the Vanguard Building, previously the MPH bookstore, built in 1908. MPH at that time stood for Methodist Publishing House but later became Malaya Publishing House in 1927. 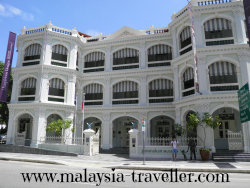 A few doors away is the Peranakan Museum. Housed in the former Tao Nan Chinese School, dating from 1912, this museum contains a fine collection of objects pertaining to the Peranakans, Malaysia and Singapore's unique hybrid community dating back centuries. In nearby Hill Street stands the Singapore Chinese Chamber of Commerce building, a 1960's construction with an interesting blend of Chinese and Western styles. Much older is the adjacent Armenian Church of St. Gregory the Illuminator. 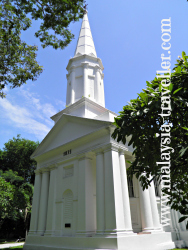 Consecrated in 1836, it was the first church to be built in Singapore and was funded by the small but influential local Armenian community. The church originally had a domed roof and Armenian style bell tower but these were replaced in 1853 by the spire and pitched roof we see today. In Coleman Street opposite can be found the Masonic Lodges and Masonic Club building (1879). For a semi-secretive organisation, it sure has a readily recognisable building - indeed the club's restaurant is open to the general public. The freemasons' high profile in Singapore is perhaps not surprising given that Sir Stamford Raffles himself was a freemason, according to the club's website. 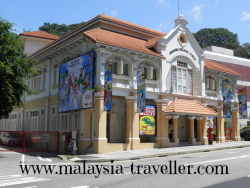 Next door is the Singapore Philatelic Museum, housed in a very quaint colonial building which was once part of the Anglo Chinese School. The museum boasts an interesting selection of Straits Settlement philatelic material and, as you would expect, a comprehensive collection of post-independence Singapore stamps. Returning to Hill Street our Singapore Heritage Walk passes the Central Fire Station (1909). Its construction led to a substantial reduction in the number and severity of fires in Singapore's crowded narrow lanes of that period. The Fire Station contains a museum. 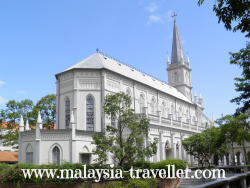 Just off the Padang is Singapore's largest church, the Anglican St. Andrew's Cathedral, which was opened in 1861 and is the second church to be built on this site, the earlier one having been demolished after twice suffering lightning damage. It is said to have been built using Indian convict labour which was not an uncommon practice at that time. The Padang is a large rectangular grassy field which was set aside for recreational purposes by Singapore's early colonial planners. It was used mainly for cricket, to exercise horses, for walks and for military parades. It still serves as a cricket pitch and for occasions such as National Day Parades. 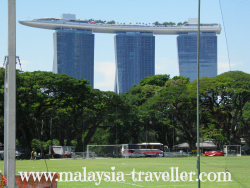 The Padang is surrounded by some of Singapore's finest civic buildings and affords a good view of the Marina Bay Sands Hotel on the other side of Marina Bay. 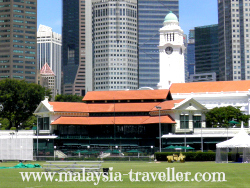 The Singapore Cricket Club occupies the southern end of the Padang. The club was established in 1852 and the current clubhouse pavilion was built in 1884, with subsequent extensions in 1907 and 1922. It has since developed into a prestigious club providing multiple sporting and dining facilities. 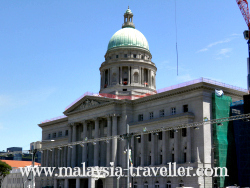 Also bordering the Padang is the Old Supreme Court Building, a relatively recent colonial-era construction, completed in the 1930's in classic architectural style. The Court relocated to new premises in 2005 and this building, together with the adjacent City Hall, is to be converted into the National Art Gallery. 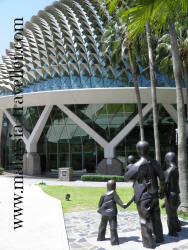 On the other side of the Padang, after passing underneath the elevated Esplanade Drive highway, there is an extraordinary pair of spiked buildings known as Esplanade - Theatres on the Bay. They are nicknamed 'the durians' due to their resemblance to the spikey fruit. They contain a concert hall, theatre and other performing venues. Crossing the mouth of the Singapore River via Esplanade Drive, or the curved pedestrian bridge currently under construction, there is a good view of the Fullerton Hotel. 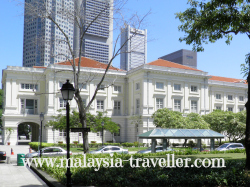 This luxury hotel occupies a 1928 building which once housed the General Post Office and the Singapore Club. In front of the Fullerton is a reclaimed promontory where Singapore's famous Merlion statue now stands. The merlion has the body of a fish and head of a male lion and is probably Singapore's best recognised mascot. The statue is less than 9m high and looks smaller than many people expect. 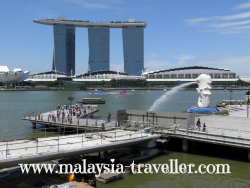 The merlion looks out towards Singapore's new iconic landmark, Marina Bay Sands, with its spectacular design of three 55 storey hotel towers capped by a giant cantilevered deck known as Sands SkyPark, complete with infinity edge swimming pool. 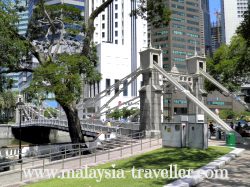 Next our Singapore Heritage Walk crosses back over the river on the Anderson Bridge, a vehicular bridge completed in 1910 and named after the then Governor of the Straits Settlements, Sir John Anderson. More recently it has been used as part of the street circuit for the Singapore Grand Prix. 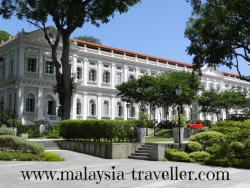 The bridge brings us to a former colonial government building named Empress Place Building, a most impressive construction which served a number of administrative functions for over 100 years before being converted into the Asian Civilisations Museum in 2003. We re-cross the river a final time using the pedestrian-only Cavenagh Bridge, named after another Governor of the Straits Settlements, Major General Orfeur Cavenagh (1859-1867). This steel suspension bridge was built by P & W Maclellan Engineers in Glasgow in 1868 and shipped out to Singapore in sections. From the bridge there is a good view upriver of Boat Quay which was once the teeming dock and commercial hub of Singapore's thriving trade activities. Bumboats and lighters would transport goods to and from ships anchored out in the river and harbour until the 1960's when Singapore's new high tech port facilities put an end to the need for bumboats. 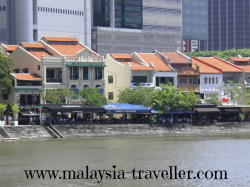 Fortunately Boat Quay survived the rampant demolition and redevelopment of the 1980's and today is a popular bar, restaurant and shopping area. Moving on to Raffles Place which was once where the city's leading commercial, banking and trading houses had their headquarters. Today the Place is dominated by the giant tower blocks of banks and insurers. 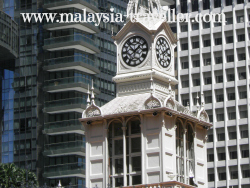 A short walk away is Telok Ayer Market, an octagonal shaped Victorian cast iron building with a smart clock tower on the roof. It now serves as a food court rather than a market. 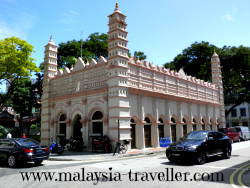 On Telok Ayer Street stands the Nagore Dargah, an ornate brick and plaster shrine completed in 1830 as a memorial to a Muslim holy man called Shahul Hamid who came from southern India. Further up the same street is the Thian Hock temple, one of the oldest Hokkien temples in Singapore, completed in 1842 in southern Chinese architectural style. A number of deities are honoured here including Ma Zu, Goddess of the Sea. 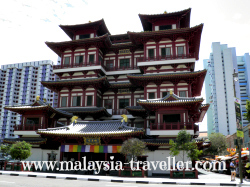 A few streets away is the Buddha Tooth Relic Temple and Museum. This is a new building, finished only in 2007, but built in traditional style. The temple houses a tooth relic which was found in a collapsed stupa in Myanmar in 1980. 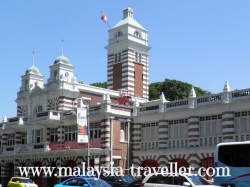 Nearby is the Jinrikisha Building (1903) which was where the government licensed and controlled rickshaws which plied Singapore's streets up until the end of the Second World War. 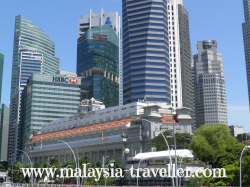 You can read more details on my Great Malaysian Railway Journeys website. 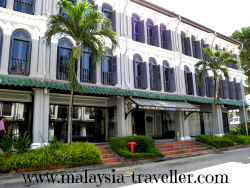 We end this Singapore Heritage Walk in Duxton Road which is located just around the corner from the Jinrikisha Building. This district was once a nutmeg plantation, then a rather seedy part of town filled with opium dens, gambling parlours and brothels. Today you can see some well preserved shophouses here. Hope you enjoy this Singapore Heritage Walk which provides a flavour of the many historical attractions that Singapore has to offer. 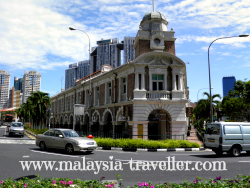 For many other city trails in neighbouring Malaysia, click here.